The Days of Johann, an agility dog! 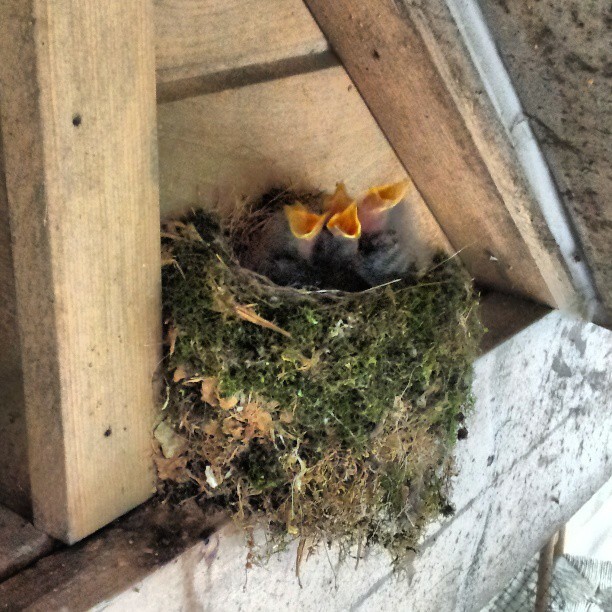 : We have/had new tenants! 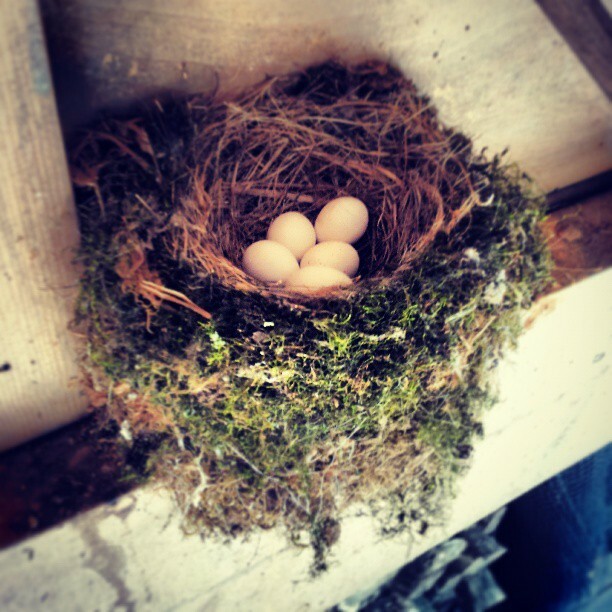 When we arrived at the cabin last year about this time, we saw that there was a nest in the upper rafters of our front porch. At that time we didn't see any inhabitants of the nest. But this year about four weeks ago, we saw that Momma bird was reinforcing the nest. Then not too long after that, we saw that she was tending the nest every evening and during the days when it was chilly, staying in the nest even when Mum would let me out for my last 'pit stop' of the evening. Fairly friendly Momma bird was only about four feet from Mum's head when she would walk out the front door. Momma would peak out at Mum as I was doing my business, but never felt threatened enough to take off. Then a few weeks ago, while Momma bird was away from the nest Mum got out the little step ladder and took this photo and found Momma had gotten busy! Then a couple of weeks later, we had new arrivals!!! Up until last night, Momma bird would tend well to the babies and sit with them at night when we go out for my 'pit stop.' They are soooo cute, aren't they? Birds are difficult to identify...but Mum thinks it may be a flycatcher. Then just last night Mum noticed that the next is empty!!! They've all flown the coop :). 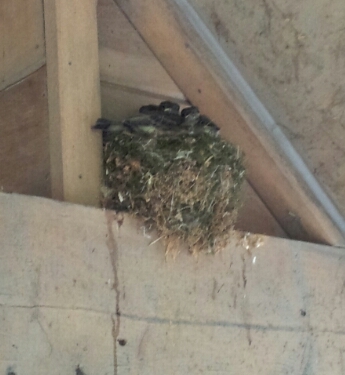 Mum snapped that first photo of them just the morning before they all took off. Good luck in life little ones! We have barn swallows that have taken up residence in our barn. They're such graceful birdies! SO CUTE!!!! We have doves which nest over our front door every year, but I've never seen the nest or babies. I watch them, through the front windows, bringing nesting materials. Your babies are adorable! That photo of the babies waiting to be fed is an absolute gorgeous classic. BTW, I notice Johann calls you "Mum". I thought in the US everyone says "Mom". BOL! @Parlance! Mum has British in her :) So I've always called her Mum. Oh, that explains the Mum-word! BTW, thanks for the addition to my post about car safety. After I wrote mine I was feeling a bit depressed about finding a good harness, but after reading your Squidoo I feel more hopeful. I'll search some more for one like the ones you recommended. I had tears in my eyes as I watched the highway rescue of the little dog.